They’re one of my favorite animals, so when I was at the Cleveland Metroparks Zoo in Cleveland, Ohio, I had to take a video of them. Did you know that where you live is a travel destination? Even if you don’t want to take a long trip, you can explore your backyard. Who knows? 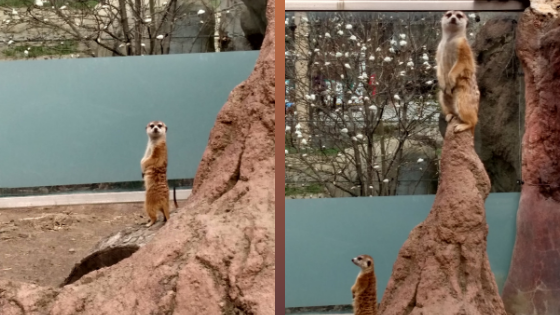 You may wind up at your local zoo where they too have cute meerkats (Suricata suricatta). Watch this video of the meerkats! These energetic animals can teach you and me a thing or two about running. Not only do they make it look fun, but they show off their stamina. They may inspire you to get your run on! These cute animals have adopted to living in a harsh desert environment. They live in large groups of 20-50 (talk about an extended family) in large underground tunnels.The dark patches around their eyes reduces sun glare and allows them to take in a wide view of their scenery. This helps them avoid being overtaken by predators. Meerkats eat both plants and animals, but their diet mostly consists of insects, which they sniff out using their enhanced sense of smell. However, they will eat small rodents, fruit, birds, eggs, lizards, and even poisonous scorpions. Good news! These funny animals are not currently endangered (they can live 12-14 years), so let’s keep it that way. They keep ecological harmony by controlling the pest population because they eat insects. However, they can be food for predators like jackals and eagles. Yes, it’s the circle of life. The next time you travel to a new city, check out their zoo. Not only can you see cute animals, but you can learn about how you can play a positive role in environment and conservation. For instance, you can buy sustainable products (sourced responsibly). These include coffee, tea, butter, toilet paper, and many other every day products. Together we can do our part to ensure wildlife and their environment will be around for generations to come.